Arianespace has successfully launched two telecommunications satellites: SGDC for Visiona Tecnologia Espacial S.A, on behalf of the Brazilian operator Telebras S.A. and the Brazilian government; and KOREASAT-7 for South Korean operator ktsat. The launch took place on Tuesday, May 4 at 6:50 pm (local time) from the Guiana Space Center, Europe’s Spaceport in Kourou, French Guiana. Today’s launch was the fourth of the year for Arianespace and the second in 2017 with the Ariane 5 heavy launcher, which also recorded its 78th successful mission in a row. In addition, it was the seventh Arianespace mission that carried two satellites built by Thales Alenia Space. SGDC, the Geostationary Defence and Strategic Communications Satellite, is the first satellite for the Brazilian operator Telebras S.A. to be orbited by Arianespace, within the scope of a turnkey contract with the company Visiona Tecnologia Espacial S.A.
Reduce the country’s digital divide by supplying high-quality internet services across all of Brazil, within the scope of a national broadband plan. Provide independent and secure strategic communications services for the Brazilian armed forces and government. Provide the Brazilian space industry with key technologies so that it can play a growing role in the country’s future space programs. 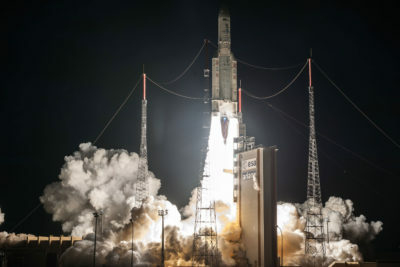 A major player in Brazil since 1985, Arianespace has successfully launched all 11 Brazilian telecom satellites for legacy operator Embratel, as well as Star One, a wholly-owned Embratel subsidiary. KOREASAT-7 is the third satellite to be launched by Arianespace for South Korean operator ktsat, a subsidiary of KT Corp, the largest telecommunications/media service provider in the country. It follows the launches of KOREASAT-3 in 1999 and KOREASAT-6 in 2010. KOREASAT-7 will provide a wide range of video and data transmission applications, including internet access, direct-to-home (DTH) TV broadcasting, government communications and connectivity to VSAT (Very Small Aperture Terminal) networks, to extend services to isolated areas. Starting with the launch of the first ever South Korean satellites – KITSAT-1A in 1992 and KITSAT-2 in 1993 – Arianespace has become a major partner to the country’s space program. Including this latest Flight VA236 mission, more than half of South Korea’s geostationary satellites have been launched by Arianespace. The company’s order book includes two more satellites for the Korean Aerospace Research Institute (KARI): GEO-KOMPSAT-2A, planned for 2018, and GEO-KOMPSAT-2B, planned for 2019. Today’s mission was the seventh Arianespace dual-launch carrying two satellites built by Thales Alenia Space. SGDC and KOREASAT-7 were built in Thales Alenia Space’s plants in Cannes and Toulouse (France), using the Spacebus 4000C4 and 4000B2 platforms, respectively. These platforms are perfectly adapted to Arianespace’s launcher family. Arianespace and Thales Alenia Space have developed a very solid and fruitful relationship since the launch of Meteosat-F2 on June 19, 1981. SGDC and KOREASAT-7 are the 147th and 148th Thales Alenia Space satellites to be launched by Arianespace. Eight more Thales Alenia Space satellites are to be launched by Arianespace in the coming years. Shortly after the announcement of the orbital injection of the two satellites, Stéphane Israël, CEO of Arianespace, said: “With this second successful launch of the year by Ariane 5, and the 78th successful mission in a row by our heavy launcher, Arianespace proudly gives our Brazilian and South Korean customers the benefits of our excellent launch services. We are honored by the confidence expressed today by Visiona Tecnologia Espacial, which chose us for its first satellite on behalf of the operator Telebras and the Brazilian government; as well as that of the South Korean operator ktsat, for whom we have launched three satellites since 1999. The SGDC satellite was built by Thales Alenia Space using a Spacebus 4000C4 platform. Its payload comprises 57 Ka and X-band transponders. Positioned at 75° West, SGDC will provide telecommunications, internet access and civil and military communications services for Brazil. The satellite weighed 5,735 kg. at launch and offers a design life exceeding 18 years. KOREASAT-7 was built by Thales Alenia Space using a Spacebus 4000B2 platform. Its payload comprises 30 Ku-band transponders, plus Ka-band transponders. Positioned at 116° East, KOREASAT-7 will supply telecommunications and broadcasting services for South Korea, the Philippines, Indonesia, India and the Indochinese peninsula. The satellite weighed 3,680 kg. at launch and offers a design life exceeding 15 years.